So much of Dark Souls is a lonely experience. There are fleeting glimpses of others in the same struggle, but you’re largely on your own. It’s why flipping the script and jumping into other people’s games is such a joy. There are two ways to interact with other players. You can invade worlds and kill them, a requirement for many of the game’s optional covenant quests, or you can help them out and be a shoulder to praise the sun on. Because I’m not a jerk (and because I’m terrible at PvP), I’ve been doing the latter. 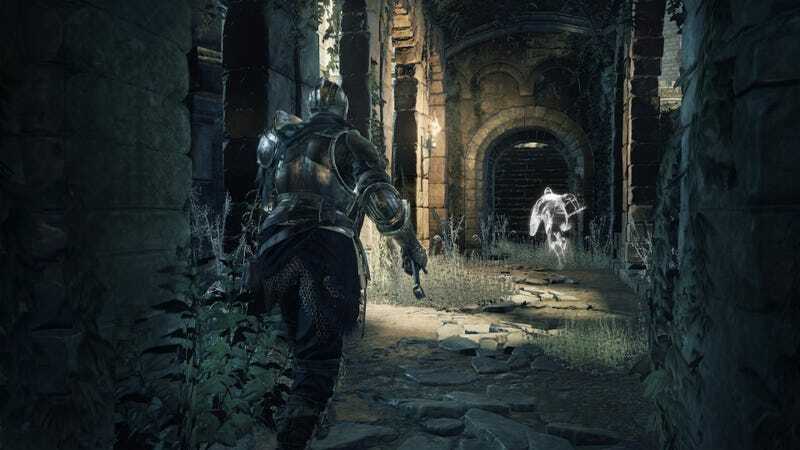 I made a list of the bosses who gave me the most trouble in Dark Souls 3, and started hanging out in front of the doors that lead to them. Depending on the time of day, it takes anywhere from a few seconds to a few minutes for someone to summon me into their world. Maybe that has something to do with the fact that my face looks like a rotted corpse? Hm. Though every person plays Dark Souls differently, I’m guessing there’s an emotional arc to arriving at the moment where they’ve asked for my help. They’ve probably been banging their head against the same boss for more than an hour. Heck, maybe this is the second day they’ve been trying to take them down, or figured a night off might give them some perspective. Unfortunately, it didn’t make a difference, and they’re still dying. “Why do people even play these games?” they ask. We’ve all been there, friend. You don’t often feel like a hero in Dark Souls. Even after taking down a tough boss, the feeling is exasperation and relief. But you get to play that part when summoned to another world in Dark Souls. After a boss goes down and the other person leaps into the air, you can’t help but smile. Dark Souls doesn’t have voice chat, so there’s no way to know how you’ve made the other person feel; everything happens through emotes. It’s hard to not feel a little bummed as the other player waves goodbye. Helping players with Dark Souls 3's biggest challenges is addicting, and keeping me from New Game Plus. Instead of starting a new challenge with my character, I’m spending evenings camped out in front of boss doors. Given how satisfying that’s been so far, that’s not such a bad thing.